I found What’s the Score? late last year through Zooniverse. I found the history behind the sheet music fascinating, but I was not satisfied simply describing it. I wanted to hear the music, but aside from a few pieces on the project page and some classical pieces on Youtube I could not find recordings anywhere. Another issue was that I did not have a piano, so I could not play the songs the way I believe they should be played. Luckily, though I didn’t have a piano, I did not have to go searching for one. With some advice and help, I found I could transcribe the sheets in a MIDI creator and play the music on my computer. A MIDI creator is a program that provides an easy way to annotate instructions to a computer’s sound card in order to produce music. So far, I have transcribed these pieces using the program Noteworthy Composer, which can be used to both produce MIDI files, print sheet music, and preview composed songs. I use the number keys to set note values and accidentals. I press ‘Enter’ to set a note on a specific place on the staff and press ‘Space’ for a rest. It’s a simple though repetitive system. Overall, I find the program easy to use and achieve good results with it. There are limits though – for one piece I needed to improvise a bit when I found that the program does not group quarter notes into quintuplets. 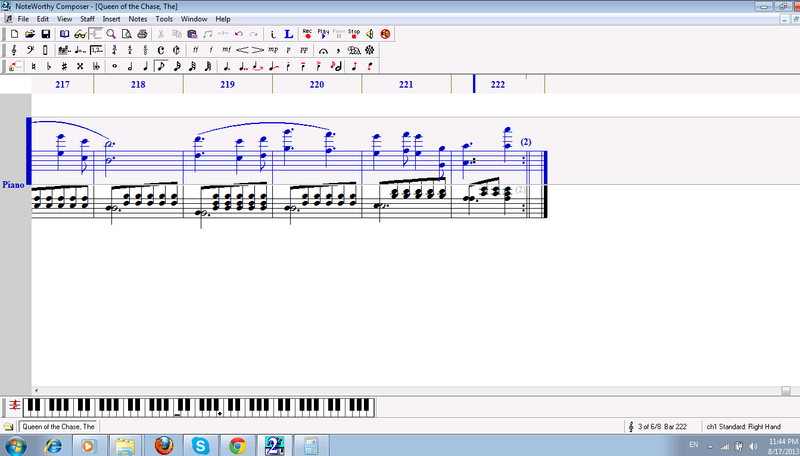 After I finish transcribing a piece of music, I listen to it, make corrections, and export it in MIDI format. From there, I convert the MIDI into an MP3 using a free converter. After that, the file is sent off to the Bodleian. Soon the MP3s will be linked from the songs themselves, and everyone can listen to the music stored in this archive. I currently enjoy making and listening to these songs, and I hope you will enjoy them too. Kelsey Gower has had an interest in music history for some time. She started transcribing sheet music out of a desire to hear the music she was describing on the What’s the Score at the Bodleian? project. Previously she has served in the United States Air Force from 2007-2013 as a linguist. During this time she earned an Associate’s of Arts in Arabic Studies. She is currently planning on attending university for a business degree. Kelsey is also a regular contributor to other Zooniverse projects. One of the new sound files on the What’s the Score? 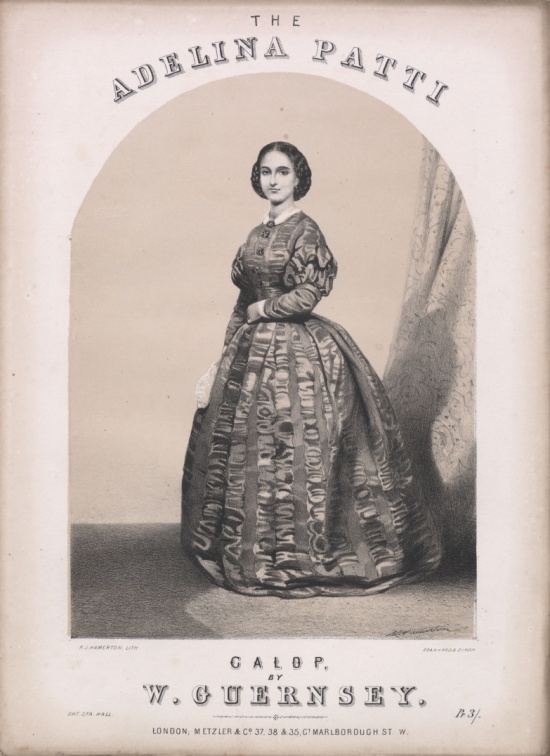 website is of a piece called the Adelina Patti Galop. Among the sheet music selected for the What’s the Score at the Bodleian? project, there are several pieces inspired by this lady, including the galop, The Adelina Patti Polka, The Adelina Waltz and the Patti Quadrilles. Probably the most famous singer of her time, Adelina Patti has been described as the second most celebrated woman in the world in the year 1900, after Queen Victoria. 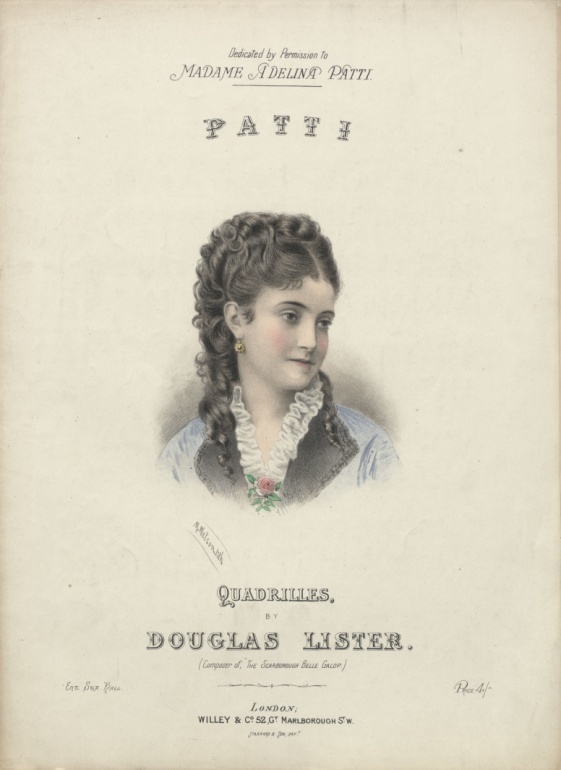 Born in 1843, into an Italian family of singers while her parents were working in Madrid, she toured the USA as a child prodigy and made her London début at the age of 18 in the demanding role of Amina in Bellini’s La sonnabula. From that point, she dominated the stage at Covent Garden for a quarter of a century, as well as performing in all the major opera houses of Europe and the Americas. Her personal life had a degree of turbulence not unusual in such circles. She married the Marquis de Caux in 1868, the French tenor Ernesto Nicolini in 1886 (after a lengthy affair) and finally the Swedish Baron Rolf Cederström in 1899. A shrewd businesswoman, she could command enormous fees and amassed a considerable fortune. In 1878, she purchased Craig-y-Nos Castle and its estate, near Brecon, where she built her own private theatre, a miniature version of La Scala, Bayreuth and Drury Lane, rolled into one. She retired officially in 1906, but continued to make charity performances until the beginning of the First World War. She died at Criag-y-Nos in 1919 at the age of 76.
she did receive lessons from family members when she was a child. In her heyday, she was renowned for her astonishing vocal agility and stamina, as well as for the beauty and purity of her tone. Her remarkable vocal technique meant that recordings she made in her 60s, in the early years of the 20th century, do more than hint at what she must have been like in her prime. After several months of development work and testing by a limited number of users, What’s the score at the Bodleian? is finally being released to the general public today. The Bodleian Libraries are enlisting the help of the public in this experimental project to help improve access to parts of their music collections. A selection of unbound and uncatalogued piano sheet music from the mid-Victorian period has been digitised and people are asked to submit descriptions of the scores by transcribing the information they see. This will help to make them more readily discoverable online. The Bodleian has teamed up with Zooniverse, world leaders in crowd-sourcing technology and the people behind various high-profile ‘Citizen Science’ projects, such as Galaxy Zoo and The Milky Way Project. They have recently branched out from purely astronomical subjects into other areas, with projects like Old Weather and Ancient Lives, and have adapted their software in order to present our music scores for the gathering of crowd-sourced data (http://www.whats-the-score.org/). In conjunction with this, the Bodleian has developed a website which will contain the digitised scores and descriptive information about them (http://scores.bodleian.ox.ac.uk). Data collected from crowd-sourcing will eventually feed into this database, to add to the basic metadata already there, making the collection searchable and available for the first time. The music selected for this project has never been catalogued by the Library so has not been readily available to users. Although music of this kind was considered to have little academic value at the time of receipt, it can now offer an insight into the nature of amateur music-making during the Victorian period and reveal something of the social history of the time. Many of the scores have attractively illustrated covers which are a subject of study in their own right. This project may lead in future to the Libraries exploring further ways in which members of the public, who may be experts in particular fields, can be encouraged to enrich the existing catalogues and other finding aids by contributing additional information about the collections. So, please sign up and become a contributor (http://www.whats-the-score.org/). For more information about the project, see http://www.bodleian.ox.ac.uk/bodley/library/specialcollections/projects/whats-the-score/. Charles d’Albert was a prolific composer who, like many other composers during the second half of the nineteenth century, based some of his dance music on popular operas or ballets. Some examples of such pieces are found among the first batch of material digitised for the What’s the Score at the Bodleian? project (visit our Recordings page for some samples). Among the works that have inspired d’Albert is Trial by Jury by Gilbert and Sullivan. What the quote shows, other than that the reviewer wasn’t particularly impressed, is that other works by d’Albert were known and appreciated in Australia at that time. It is also interesting to note how quickly dance music based on stage hits was produced and exported. 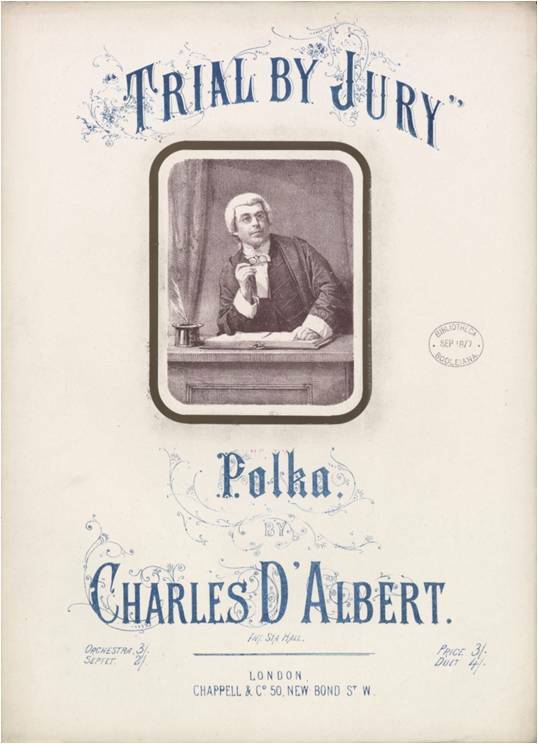 The Trial by Jury Polka scores had reached Australia within 18 months of the original opera opening in London, and then it had still been preceded by other titles, like The Trial by Jury Lancers. In his article Dance arrangements from the Savoy Operas, John Sands notes that although popular in its time, many of the pieces like Trial by Jury Polka are little known today. Many more pieces by d’Albert were published, and some of them are being digitised and made available through our What’s the Score at the Bodlian? project. A list of d’Albert music can be found in Universal Handbook of Musical Literature (on pages 128-132) available online at The Open Library. In this recording of Trial by Jury Polka, created for the What’s the Score at the Bodleian? project, we hear Ben Sheen on the piano. The recording is released with the Creative Commons BY-NC-SA licence. It can be reused and redistributed globally provided that it is used in a non-commercial way and the reuse is attributed to “What’s the Score at the Bodleian?” and Ben Sheen. If you derive a new work from the recording, the new work may be distributed provided it is released under the same licence. You can read about the recording session when this and other pieces were recorded in our ‘So that’s what they sound like…’ blog post. More project recordings and scores are available on the project webpage. The version of The Cleopatra Galop that the What’s the Score at the Bodleian? 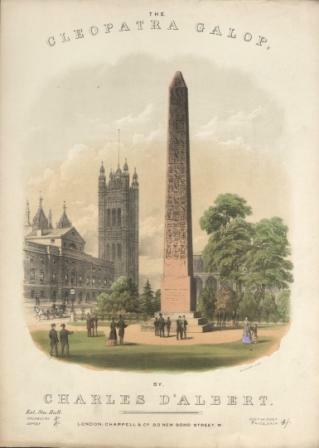 project is digitizing has a cover featuring a big obelisk, not unlike Cleopatra’s Needle, the famous London landmark. The Cleopatra Galop was written by Charles d’Albert, a prolific composer of the time and former dance-master. 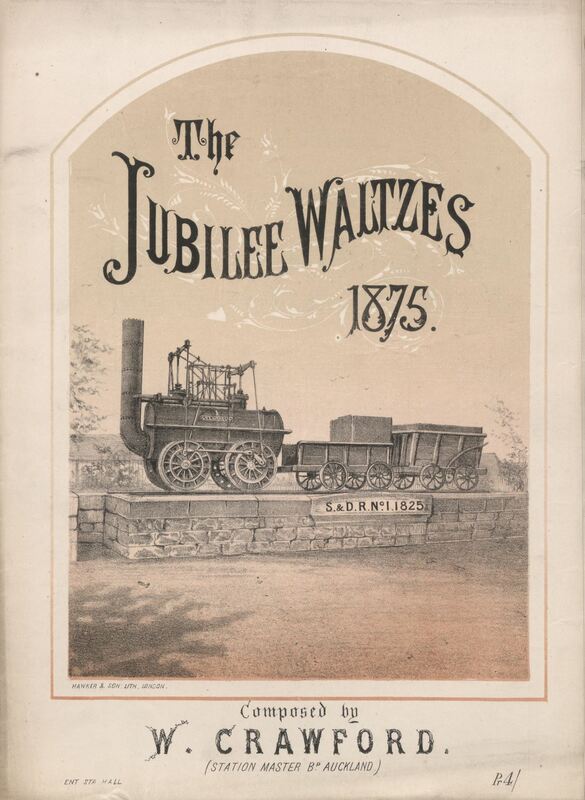 The piece is advertised as ‘new dance music’ in the New Zealand The Hawke’s Bay Herald from 19 April 1878 (Volume XXI, Issue 50417, page 1), so it must have been written well before then to allow time for the scores to be printed and then transported all the way to Napier. D’Albert’s music was not infrequently inspired by contemporary events and it is easy to imagine that the move of the Egyptian obelisk may have influenced this piece. It could also be the case that the piece was simply a reflection of the Victorian fascination with all things oriental and that the cover is a later addition, perhaps to a later re-print? The obelisk was, after all, only erected in September 1878 – several months after the arrival of the scores in New Zealand. In this recording of The Cleopatra Galop made for the What’s the Score at the Bodleian? project, we hear Tim Hawken on the piano. You can read about the recording session when this and other pieces were recorded in our ‘So that’s what they sound like…’ blog post. More project recordings and down-loadable versions of the Cleopatra Galop and other scores are available on the project webpage. This recording is released with the Creative Commons BY-NC-SA licence. It can be reused and redistributed globally provided that it is used in a non-commercial way and the reuse is attributed to “What’s the Score at the Bodleian?” and Tim Hawken. If you derive a new work from the recording, the new work may be distributed provided it is released under the same licence. Audran’s opera Olivette (Les noces d’Olivette) was first played in Paris in 1879 and then in London in 1880-1881 (English language adaptation). It must have been well received because not only did it go on to play at the Strand Theatre for 466 performances but the music was also adapted and released in several versions intended for home use. 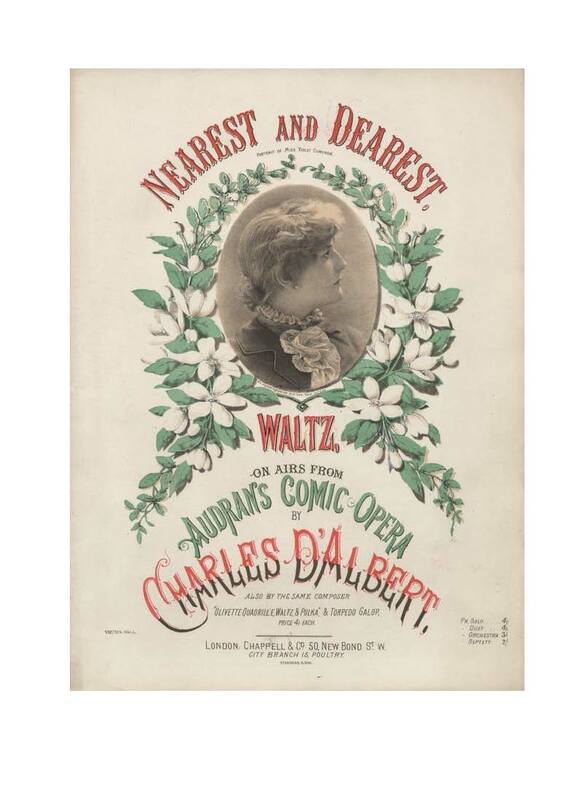 Charles d’Albert, the prolific composer/arranger, produced a waltz for piano (solo or duet) based on airs from the opera. Vocal pieces and pieces for the piano were also released, as demonstrated by adverts placed by Chappell and Co in other music publications (such as in this version of Iolanthe from 1882). D’Albert’s version is marketed under the heading ‘dance music’ and was presumably intended not only to be played and listened to but also to be suitable for dancing. That d’Albert’s dance music was popular is not surprising when it is considered that he was very familiar with dance himself. Before he dedicated his time fully to composing and teaching, d’Albert had been a dancer. He had worked with in Paris and been a ballet-master at the King’s Theatre, London, and Covent Garden. He also published a book on ballroom etiquette. 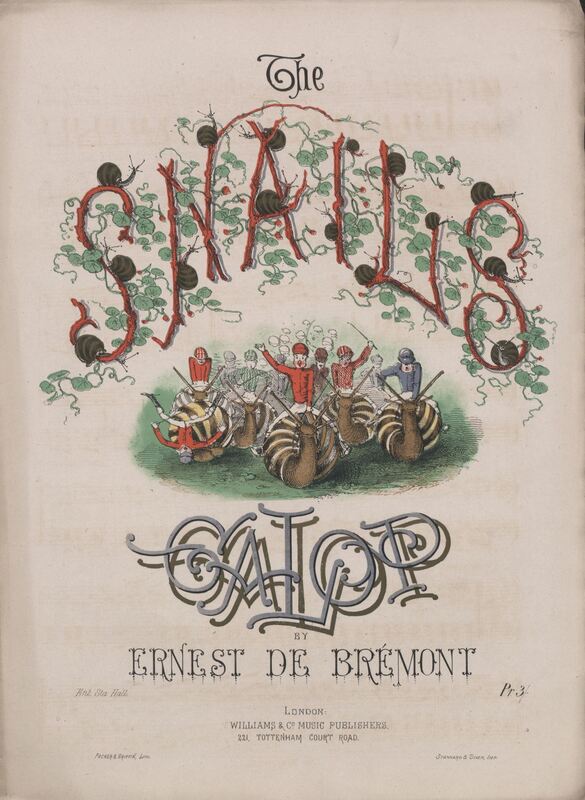 The cover of the scores digitised by the What’s the Score at the Bodleian project advertises other works by the same composer: “Olivette Quadrille, Waltz & Polka” & Torpedo Galop. The cover also features a portrait of Violet Cameron who starred in the London production of Olivette. Cameron (1862-1919) had made her stage début only eight years old, and went on to have an intermittent career in comic opera and opera bouffe. She is said to be “blessed with extremely blond hair [and] a fine figure” (Richard Foulkes, Oxford Dictionary of National Biography). In this recording of the Nearest and Dearest waltz, made for the What’s the Score at the Bodleian project, we hear Ben Sheen on the piano. The recording is released with the Creative Commons BY-NC-SA licence. It can be reused and redistributed globally provided that it is used in a non-commercial way and the reuse is attributed to “What’s the Score at the Bodleian?” and Ben Sheen. If you derive a new work from the recording, the new work may be distributed provided it is released under the same licence. The Royal Aquarium was an entertainment venue in Westminster, London, which opened in January 1876 with royal pomp and circumstance. As suggested by the name, a major feature of the venue was a set of large aquariums (although due to ‘operational difficulties’, these did not hold any fish). There were also rooms for different types of entertainment including a theatre, a roller skating rink, and a library as well as drinking bars, a restaurant and even a hairdresser’s! The cover of The Rink Gallop scores shown here gives an indication of what The Royal Aquarium may have looked like at the time. The music for this piece of dance music was written by Charles d’Albert. As it is advertised in the contemporary weekly magazine The Musical World from January 6th 1877 it is likely that it was written the same year the Aquarium was opened (1876). 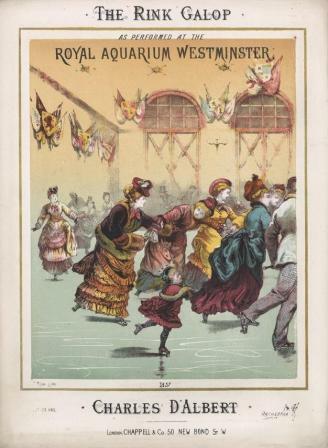 The Rink Galop is one of hundreds of d’Albert’s pieces listed in The Universal handbook of musical literature (p. 132). The Handbook was published in 1900 and claims to feature “all published compositions which at the present time are included in the various catalogues as being still obtainable at the original prices.” (introduction, page A*). That suggests the piece was still for sale a quarter of a century after it was first published. In this recording of The Rink Galop, created for the What’s the Score project, we hear Ben Sheen on the piano. The recording is released with the Creative Commons BY-NC-SA licence. It can be reused and redistributed globally provided that it is used in a non-commercial way and the reuse is attributed to “What’s the Score at the Bodleian?” and Ben Sheen. If you derive a new work from the recording, the new work may be distributed provided it is released under the same licence. More information about the Royal Aquarium can be found in, for example, The Royal Aquarium, and Imperial Theatre, Westminster, London by Arthur Lloyd and Sullivan and the Royal Aquarium by John Sands. This Bodleian Libraries project aims to make music scores from the Bodleian collection available online with the help of members of the public. The scores will be scanned and the images will be put online. Interested parties will be invited to help make the material more easily discoverable by adding information about the images. It is not necessary to be able to read music or play an instrument to take part – anyone can help!